Paul and Jenny Saban know a thing or two about building beautiful gardens. In their native Britain in 2000, their ornamental garden with its myriad ponds and fountains was voted, “Pond of the year,” by “Koi Ponds & Gardens Magazine.” That is quite an achievement considering that half of the people in Britain seem to spend their time transforming their back gardens into an aquatic paradise. 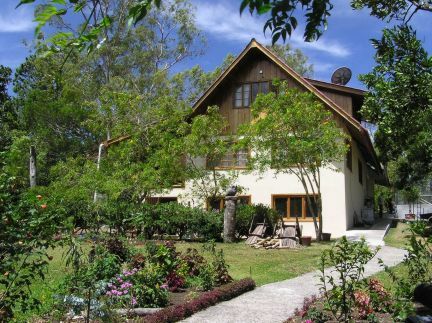 Panama’s premium animal rescue center. This will be much more than a beautiful place to visit, because this will be Panama’s premium animal rescue center. Already the Sabans have saved a host of animals ranging from a Pygmy Owl to a Margay (medium sized jungle cat) – an animal that was confined in so small a space, that its tail is permanently crooked. Paul and Jenny both lament that there is a “Lack of education on how to look after animals.” Jenny pointed out some yellow “canaries” in a cage on the verandah – except these weren’t yellow or canaries, they were ordinary green parrots that had been bleached, and then dyed, so they could be sold for more money. 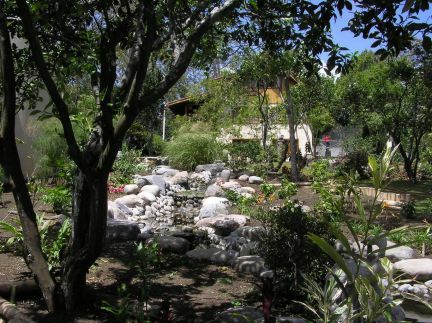 Part of the work at the gardens will be in instructing people on how best to care for and keep Panama’s fabulous fauna. 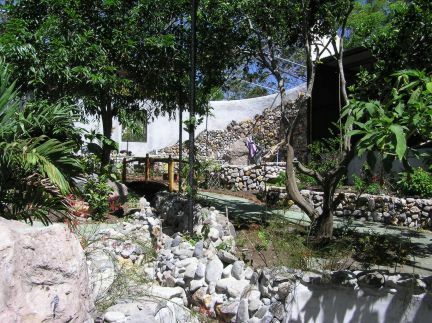 Paradise Gardens will be pre-view opening to the public at Easter, after which there will be a small entrance fee of $5, to help in the upkeep of the gardens and to ensure that the rescue and rehabilitation services continue. 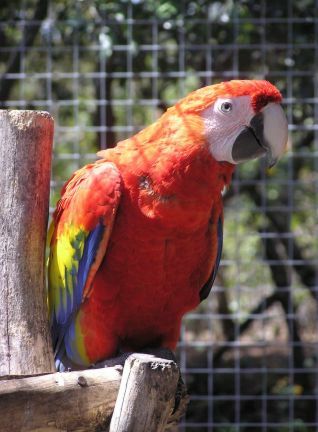 exotic and brilliantly colored birds, including parrots, parakeets, toucans, cockatoos, and macaws from South America and from as far away as the Mollucan Islands. There will be no shortage of the four-legged animal kind as two white-faced Capuchin monkeys are the newest additions in the animal enclosure. As we stood on the front porch of the main house, Jenny showed us a kinkajou. This is another rescued animal that has integrated well with humans. “Holy cow!” I exclaimed as the demure little creature opened its mouth and out came a 5-inch tongue. Nearby was another similar looking creature. At first I thought this was another kinkajou but Jenny corrected me, “No, this is a Cacomistle.” I must admit having her write the name down, as this was another “new” animal for me. For twenty years in England, Paul and Jenny kept exotic birds. 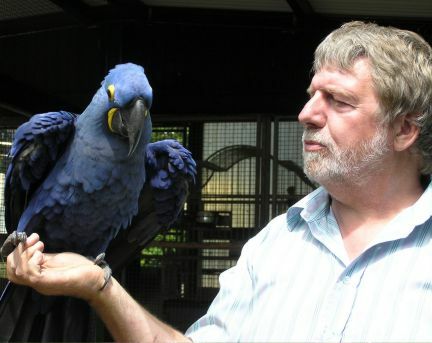 If you watch Paul interact with his many feathered friends, you can observe something very rare in this world – a complete bonding of animal with human, in a mutual embrace of affection, caring and complete trust. Jenny loves to garden - and it shows. She admits it’s her passion and the profusion of multi-colored blooms that decorate the grounds is evidence of her considerable skills, not to mention her obvious green thumb. Her crowning glory may well be the Japanese water-garden and pavilion, that is in the finishing stages of construction. Work is well along on constructing the biggest butterfly house in the country. This will be an eye-opener for many. I recall some years ago, seeing some chrysalis or pupae (butterfly eggs) and was astonished to see, what appeared to be, droplets of pure gold, silver and a pearl. That is one thing about nature; the more you delve into it, the more amazing it becomes. The wonders of nature should be available to everyone, and bless their heart’s the Saban’s, at some cost, have made their garden fully wheelchair-accessible. Further to this, in the future, there are plans to build some care-free facilities on the grounds. So people can spend their retirement years in one of the most beautiful spots on earth. The final question I posed to Paul and Jenny Saban was, “Why are you doing this?” Their answer was simple, they wanted to share what they have. Paul’s many hard-working years as a Master Stonemason in England provided his family with a good life. Now he and his wife will in turn provide many hours of enjoyment and education for the people of Panama. The animals of Panama are slowly beginning to realize that some really nice people have moved into their neighborhood.